Step1. 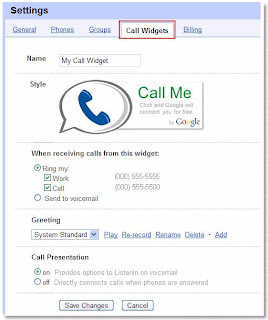 Login google voice and Go to Settings. Step2. 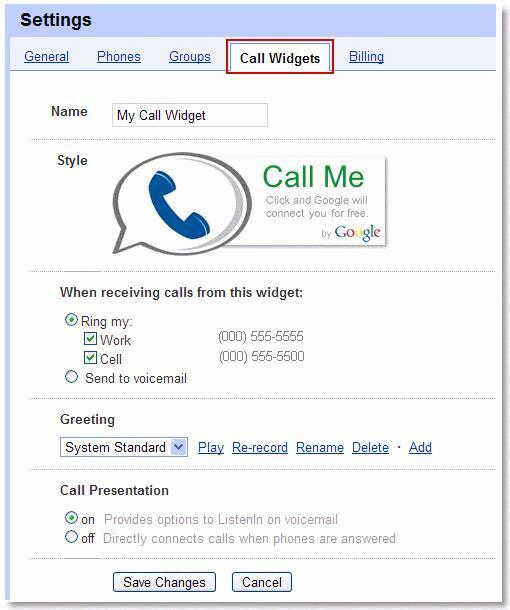 Click the Call Widgets tab. Step3. Click the Add a new Call Widget link. Step4. Select the appropriate settings for your widget. Step5. Click the Save Changes. Then, copy and paste the code in the 'Embed' field into your webpage, your blog, your auction or networking site, or anywhere you want. PS: It is free within the continental US. All other calls are charged at the rates shown here(https://www.google.com/voice/rates). Enjoy the hi-tech life and have fun. Hello Jack! Thanks for stopping by my blog. I"m now following yours. Hey! I just stumbled onto your blog via the friday meme, and I had to leave a comment telling you how wonderful I think your blog is! Your design is pretty, and your content is great! As a native Swede,I am particularly proud of my love poetry suite Sonnets for Katie. Just stopping by to say thank you for visiting Happy Snappy and to wish you a good day! Greetings from Finland and Scotland! Thanks for sharing and this is really helpful!~ thanks again!